sd0061, the legend of Beihang University ACM-ICPC Team, retired last year leaving a group of noobs. Noobs have no idea how to deal with $m$ coming contests. sd0061 has left a set of hints for them. There are $n$ noobs in the team, the $i$-th of which has a rating $a_i$. sd0061 prepares one hint for each contest. The hint for the $j$-th contest is a number $b_j$, which means that the noob with the $(b_j + 1)$-th lowest rating is ordained by sd0061 for the $j$-th contest. The coach asks constroy to make a list of contestants. constroy looks into these hints and finds out: $b_i + b_j \leq b_k$ is satisfied if $b_i \neq b_j,$ $b_i < b_k$ and $b_j < b_k$. Now, you are in charge of making the list for constroy. There are multiple test cases (about $10$). The $n$ noobs' ratings are obtained by calling following function $n$ times, the $i$-th result of which is $a_i$. For each test case, output "Case #$x$: $y_1$ $y_2$ $\cdots$ $y_m$" in one line (without quotes), where $x$ indicates the case number starting from $1$ and $y_i$ $(1 \leq i \leq m)$ denotes the rating of noob for the $i$-th contest of corresponding case. There is a skyscraping tree standing on the playground of Nanjing University of Science and Technology. On each branch of the tree is an integer (The tree can be treated as a connected graph with N vertices, while each branch can be treated as a vertex). Today the students under the tree are considering a problem: Can we find such a chain on the tree so that the multiplication of all integers on the chain (mod 106 + 3) equals to K? Can you help them in solving this problem? There are several test cases, please process till EOF. Each test case starts with a line containing two integers N(1 <= N <= 105) and K(0 <=K < 106 + 3). The following line contains n numbers vi(1 <= vi < 106 + 3), where vi indicates the integer on vertex i. Then follows N - 1 lines. Each line contains two integers x and y, representing an undirected edge between vertex x and vertex y. For each test case, print a single line containing two integers a and b (where a < b), representing the two endpoints of the chain. If multiply solutions exist, please print the lexicographically smallest one. In case no solution exists, print “No solution”(without quotes) instead. For more information, please refer to the Sample Output below. The last trial Venus imposes on Psyche is a quest to the underworld. She is to take a box and obtain in it a dose of the beauty of Prosperina, queen of the underworld. There are $ n $ palaces in the underworld, which can be located on a 2-Dimension plane with $ (x, y) $ coordinates (where $ x, y $ are integers). Psyche would like to find the distance of the closest pair of two palaces. It is the password to enter the main palace. However, the underworld is mysterious and changes all the time. At different times, exactly one of the $ n $ palaces disappears. Psyche wonders what the distance of the closest pair of two palaces is after some palace has disappeared. Print the sum of the distance after every single palace has disappeared. To avoid floating point error, define the distance $ d $ between palace $ (x_1, y_1) $ and $ (x_2, y_2) $ as $ d = (x_1 - x_2) ^ 2 + (y_1 - y_2) ^ 2 $. The first line of the input contains an integer $ T $ $ (1 \le T \le 5) $, which denotes the number of testcases. For each testcase, the first line contains an integers $ n $ $ (3 \le n \le 10 ^ 5) $, which denotes the number of temples in this testcase. The following $ n $ lines contains $ n $ pairs of integers, the $ i $-th pair $ (x, y) $ $ (-10 ^ 5 \le x,y \le 10 ^ 5) $ denotes the position of the $ i $-th palace. For each testcase, print an integer which denotes the sum of the distance after every single palace has disappeared. Perhaps the sea‘s definition of a shell is the pearl. However, in my view, a shell necklace with n beautiful shells contains the most sincere feeling for my best lover Arrietty, but even that is not enough. Suppose the shell necklace is a sequence of shells (not a chain end to end). Considering i continuous shells in the shell necklace, I know that there exist different schemes to decorate the i shells together with one declaration of love. I want to decorate all the shells with some declarations of love and decorate each shell just one time. As a problem, I want to know the total number of schemes. There are multiple test cases(no more than 20 cases and no more than 1 in extreme case), ended by 0. For each test cases, the first line contains an integer n , meaning the number of shells in this shell necklace, where 1≤n≤105 . Following line is a sequence with n non-negative integer a1,a2,…,an, and ai≤107 meaning the number of schemes to decorate i continuous shells together with a declaration of love. For each test case, print one line containing the total number of schemes module 313 (Three hundred and thirteen implies the march 13th, a special and purposeful day). 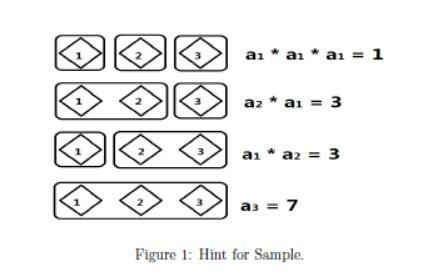 For the first test case in Sample Input, the Figure 1 provides all schemes about it. The total number of schemes is 1 + 3 + 3 + 7 = 14.